“We will be stopping the war games which will save us a tremendous amount of money, unless and until we see the future negotiation is not going along like it should. But we’ll be saving a tremendous amount of money, plus I think it’s very provocative,” Trump said at a press conference in Singapore. “Under the circumstances that we are negotiating a very comprehensive, complete deal, I think it’s inappropriate to be having war games,” he said, using North Korea’s preferred description of the military exercises. “I’d like to be able to bring them back home, but that’s not part of the equation right now,” he added. The announced suspension in military exercises alarmed some foreign policy experts in Washington who argued that the president was giving up a form of leverage over the North Koreans, and jeopardizing U.S. alliances. “If our alliances are getting weaker and we’re not going to do military exercises, where is the pressure?” said Michael Green, senior vice president for Asia and Japan Chair at the Center for Strategic and International Studies (CSIS), during a phone briefing. Even some staunch Trump allies said they were a bit concerned. Sen. David Perdue (R-GA), who has spent a significant time living and working in East Asia, told a group of defense reporters at a breakfast roundtable Tuesday morning that he was “surprised” and “troubled” by the announcement. “The coordination with South Korean military is absolutely critical,” he said. However, he indicated he would need to find out more before making a judgment. North Korea and its ally China have long sought for the U.S. to end its joint exercises with South Korea, arguing that they are aggressive and provocative. 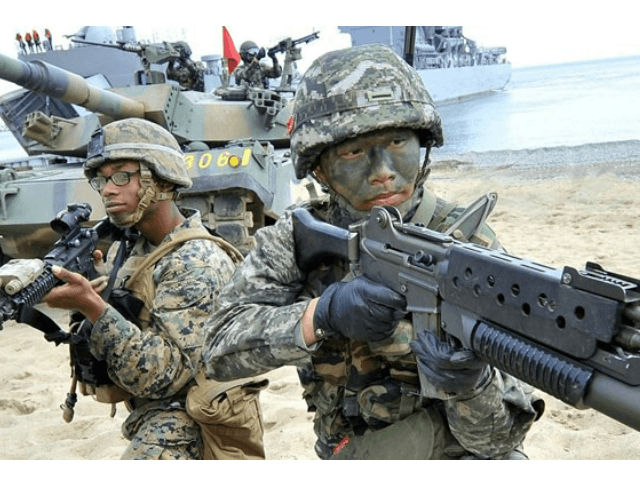 The U.S. has conducted those exercises for decades, not only as a show of unity with South Korea, but also to maintain readiness for an attack by North Korea. Vice President Mike Pence allegedly assured some GOP senators Tuesday morning that U.S. military exercises in South Korea would continue. “. @VP was very clear: regular readiness training and training exchanges will continue,” Sen. Cory Gardner (R-CO) tweeted. A senior U.S. defense official told CNN the Pentagon would work with the White House and the State Department to determine how to carry out the president’s intent on exercises. Issues to be determined included whether it is a temporary or permanent suspension, the level of exercises impacted — all or only major ones – the impact on allies, and whether there are any conditions North Korea must meet before exercises are called off. Chief Pentagon Spokeswoman Dana White told Pentagon reporters that Defense Secretary Jim Mattis was aware of the decision before it was announced and was in “alignment” with the president. But according to Green, Trump had not notified South Korea or Japan before announcing the decision, catching them by surprise. “I can tell you definitively he did not, they had no idea this was coming,” he said. “Prime Minister Abe has invested a lot in his relationship with Trump. He cannot show panic. He cannot show daylight with the president, politically at home or vis-à-vis the Chinese and the North Koreans,” he said. But Sue Mi Terry, senior fellow and Korea Chair at CSIS, said even if the U.S. did not consult with the South Koreans, she thought they would be fine with it. “I think South Korea will be OK with the news, because they’re just so, you know, out and up front about in terms of just getting – you know, making progress with North Korea. So I think it’s an easier sell to South Korea,” she said. Other GOP lawmakers — even those at opposing spectrums — did not express too much concern. “I really don’t care how generous we are as long as we don’t go too far when it comes to our troop presence. At the end of the day this is our last best chance to end this conflict without a war. I’m very open minded to security agreements and to economic incentives to North Korea, but I am very close-minded when it comes to withdrawing our forces,” he said. Sen. Rand Paul (R-KY), who is typically at the opposite end of the spectrum when it comes to hawkishness, agreed with Graham on the issue. “Most of diplomacy is not about unconditional surrender. It’s really about trying to figure out what can we give the North Koreans. So I think giving up the war games, which happens twice a year, is a perfectly appropriate thing to do, as President Trump said, as long as there is progress,” he said.